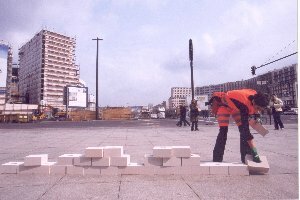 In 2004 the fifteens anniversary of the wall coming down is taking place. All 40 stones of my performance piled up together are as hight as the Berlin wall was. I walk the wall by picking up the stones in the back and adding it to the front again. A wall is seperating, is cutting, is a capitulation without a dialog, an understanding, it is a barrier, a barricade, it hides…. My wall gives up the static cold, the frozen status, ît is moving, I walk it like a dog all the way along the former wll line. This symbolic piece of architecture is moving along a historic part of Berlin and is present again for a moment – 15 years after the wall was coming down.